Commander Charles Kwetche is appointed to the elderly NASA frigate, Cabot; his mission, investigate the disappearance of the European cruiser Onbevreesd in the Jovian system. As he probes into the loss, Kwetche finds a deepening mystery involving the exobiological expedition of an industrial conglomerate; the alarming actions of a United Nations cruiser, and a mysterious signal aimed at Europa. Four Stars "Perhaps we can thank Star Trek for some of the ridiculous tropes we hold about space travel. The idea, for example, that a ship is a clean, well-lit place, and when it get hits by a weapon, the bridge crew just lurch forward in their seats a little bit. 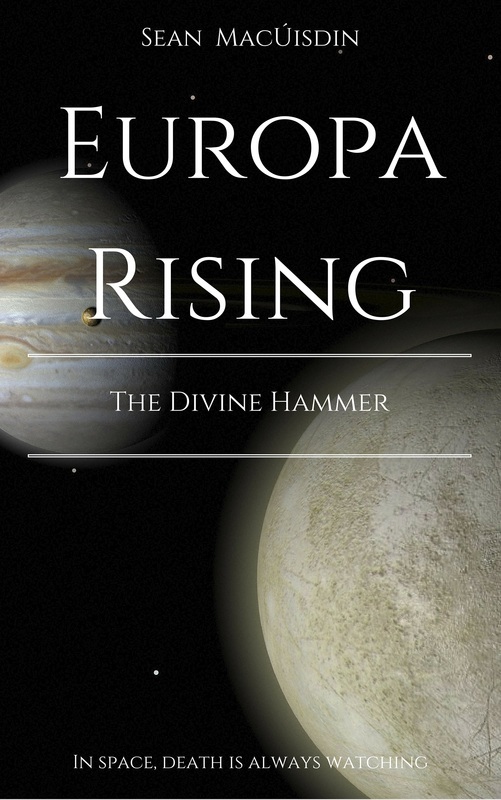 MacUisdin's book, Europa Rising, has many merits, but chief among them is the gritty realism with which he presents the exploration of our solar system--tiny little capsules of life in a hostile environment. MacUisdin, an ex-Navy man himself, knows all about this: Extended trips from home in cramped mechanized quarters, eating bad rations, dealing with broken parts and living under a constant military grind. Not only does he know, but he communicates it wonderfully in his writing. He puts you in there. Similarly, MacUisdin has a knack for action scenes, and these, for me, are a highlight of his writing. Whether it's the complex navigation and engineering of a battle between two ships, or a rough-and-tumble long gun shootout aboard a vessel, MacUisdin's narrative is bang on. Characters are not boiled down into good guy/bad guy archetypes. MacUisdin draws each character in three dimensions and presents their complex motivations clearly to the reader, allowing the sympathies of the reader to move about. I lso enjoyed the dialog. The space fleet consists of citizens from around the world and MacUIsdin does a good job captruing the vernacular of each. As a Canadian myself, I particularly enjoyed the Newfie cant. He captured some of their idioms wonderfully. The story itself gets off to an explosive start. There's a lull as MacUisdin struggles to set the stage for the rest of the book, but once we get back to the action, he paces the plot and builds suspense steadily to great ending." Four Stars "An excellent first novel. The style is fast and focused on the plot but with a superbe eye to just the right and just enough characterization to keep you enagaged with the people who inhabit these future warships. And there was just enough technical detail to give the sense the ships and their crew are real and this is a future just a few years from now. I literally lost a night to this book - I simply could not put it down once I started." Four Stars "If you like writing that shows a knowledge of military,especially naval, thinking then this is the book for you. I like that it made me think that navigation in space might be a lot like navigating a submarine. Interesting thoughts on what it is to be command. Sometimes the multicultural nature of the imagined groups gets in the way of the flow; there are many exclamations made in languages from around the world which sometimes become too much. I can really hear the voice of his characters with a Scottish background. There are some twists which keep you wondering who is the enemy. If you don't like technical references then it is probably not a book you would enjoy. Definitely leaves you with questions at the end, but does wrap up the immediate questions presented in the book." The fears of generations are realized in a brilliant flash in the shadowy wastes beyond Jupiter. From a mysterious array appear two alien ships, their vicious intention all too clear as they fall upon a pair of Terran ships battling over ownership of the enigmatic discovery. They come from Gliese 581g where, in 2008, a message of peace was sent. They are an avenging force, unleashed to deliver a terrible retribution upon a trusted industrial magnate and secret liaison who is now determined to steal their technology. The aliens are powerful, technologically advanced by many decades, and determined to end the human threat. Captain Ian Walker, recently retired from NASA and at the end of a career that saw him removed from his last command in disgrace, is called back because of his rare combat experience and is given command of the elderly monitor, NASS Centaurus. Captain Corina Sacramento, her crew exhausted and her ship worn out after completing a seven month asteroid survey for the South American Space Agency is waylaid from her return mission to Earth and redeployed to the Jovian moon of Himalia. 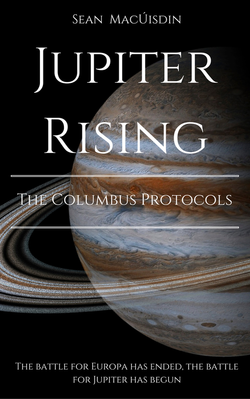 Commodore Sorscha Cameron, former commander of the European cruiser, Indomptable, is given a field promotion and the impossible task of holding the Jovian System. Their mission is simple – they are to join the United Nations task group assigned to protect the Terran interests in the Jovian System and shield the excavation of an alien spaceship buried in the ice of Europa. As the Gliesiuns amass a powerful force, and the spacefaring nations of Earth, Luna, and Mars argue over control of defences, all three must fight feelings of self-doubt and fear to rally their task group to defend the future of mankind in the outer solar system. Five Stars "I'm a big fan of military sci-fi and 'Jupiter Rising' is filled with the strategy and detail that keeps the story flowing. The author develops the characters in a way that adds depth to the story on several levels. When writing sci fi the author is unbounded in their imagination and creativity so remaining grounded in some semblance of the limits of physics and science in general helps provide integrity to the story. Read 'Europa Rising' first to get the "lay of the land" and Jupiter Rising will be all the more enjoyable." Four Stars "Sean MacÚisdin uses his experience from the Royal Canadian Navy to good effect as he spins a tail of humanities first battles with aliens in space. The story is fast paced form the start. When there is no action, then there is suspense as human and Gliesiun warships play cat and mouse before pouncing."